John will shortly return from a World Land Trust staff and supporter trip to Paraguay and will no doubt report on the journey here in Green Issues, perhaps including an account of having finally seen in the wild that most elusive of animals: The jaguar. I hope so, but if he still hasn't been lucky enough to spot one, let's hope none of the first-time visitors in the group did when John was looking the other way, or there will be no end to his grumbles! In the meantime I thought I'd squeeze in the last and long overdue account of my visit to Paraguay – now a distant six months ago. "Los Exploradores" performing a song they had written themselves, complete with synchronised arm movements, which not everybody had mastered! Generally speaking not many local children stay in Bahía Negra when they grow up – there's simply not much there for them to do, and being located in a really isolated part of the country, the temptation to move south to the cities is great. The Eco Club provides some of the training needed to equip future reserve staff with key skills for managing the reserve and visitor facilities. Most of my time in Paraguay was spent in the company of only a few people, so it was great to be able to meet with all the children of the Eco Club (who were very keen to practice their English) and witness their apparently endless enthusiasm for the club and the reserve. 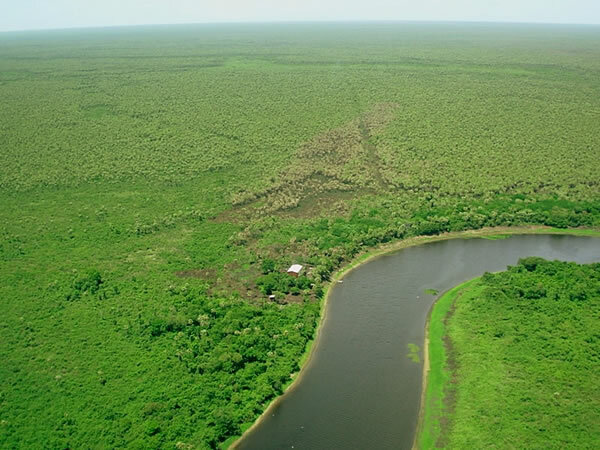 This image, taken from a plane by Pepe Cartes of Guyra Paraguay, shows just how isolated the Three Giants Lodge is. The lodge is the small white square on the riverside, and it's completely surrounded by the vastness of the Pantanal wetland, forest and palm savannah. A few weeks ago I watched a TV programme about the (Brazilian) Pantanal and the giant otters living there. Seeing the floating lily leaves, the otters' heads bobbing up and down in the water and hearing the call of a Great Kiskadee and grunting of herons and jabirus, I was transported right back to the Chaco-Pantanal Reserve. If it wasn't for the distance and cost involved, I would not hesitate to make it my annual holiday destination! The Pantanal is quite simply a fantastic place to go for a complete wilderness experience. 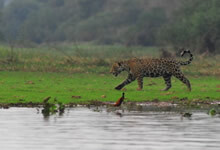 The relatively high chance of seeing jaguars is a clear bonus! It's a heaven for birdwatchers too – as is the rest of the country. 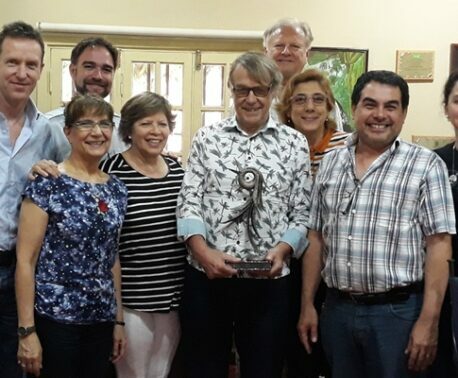 As John pointed out in an earlier blog post about visiting Paraguay: "Paraguay is at the cross-roads of several very important biogeographical regions. This makes it a very good place to go and see a huge range of species." San Rafael, with its combination of forest and grassland, makes a perfect location for watching butterflies and birds – with the added bonus that it's relatively close to cities and airports. With a track running through the reserve it also makes it a tad more accessible to visitors who may not want to walk for miles along narrow forest trails. 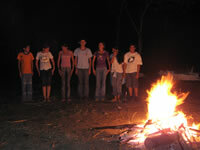 Going to Paraguay also makes for a great conversation starter! If I had a penny for every person who asked me "Why Paraguay? "… Well, why not? The wildlife, the people, the cheap cost of getting around – and the fact that there weren't thousands of other tourists, made my trip thoroughly enjoyable. In the meantime, adventurous travellers can get the best of two worlds: Intimate contact with nature, whilst sleeping in a comfortable bed! 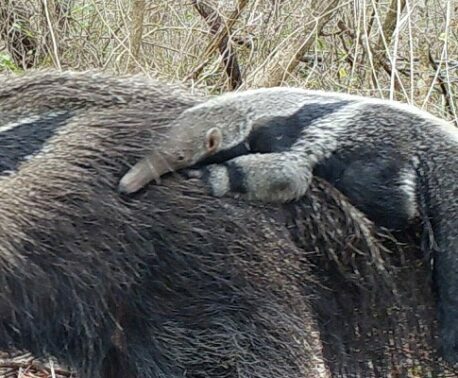 See also the previous blog posts about my stay in Paraguay and some wildlife videos I made whilst in Paraguay, which can be seen on WLT's new multimedia website Wildlife Focus. 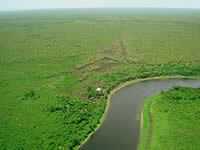 "The Pantanal – the world's biggest wetland, the size of Britain… and home to the planet's largest population of Jaguars. These big cats are notoriously hard to find, let alone film. But when Tigress Productions heard of a location where they were being sighted regularly, Nigel Marven couldn't wait to get there." I knew very little about birds before going to Paraguay – not because I wasn't interested, but because I never had anyone to teach me, and always had a slight fear of binoculars (don't ask). Now, on the other hand, I feel as if I know more about birds in South America than I do about European birds, and have also managed to identify some species here in the UK that were previously unknown to me, based on their similarities to their South American cousins. Finally, a massive thank you to everybody at Guyra for having me, showing me around and making me speak Spanish (mostly), despite not being very good at it.